George Osborne’s idiotic little handwriting analysis stunt, which tried to prove that Gordon Brown showed flawed judgement, was well reported in the press earlier in the week (click here for the Times coverage of the story)/ I would also recommend these posts on the subject by two of my favourite bloggers, Tom Freeman and Snowflake . Ben Goldacre’s Guardian column, Bad Science, is always worth reading. 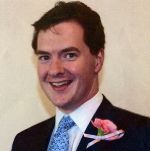 This week’s column is inspired by Osborne’s stupid stunt. Click on the link above to read the full article. What does it mean when the shadow chancellor of the exchequer is using graphology to attack Gordon Brown? Just to backtrack: Gordon and George squabbled, Gordon threw papers across the George scooped them up, saw handwritten notes, and sent them off to a graphologist to find out all about the secret inner Gordon. Now you don't need me to tell you that graphology is quack nonsense on a par with astrology or tarot. "The writer is not shy. The writer shows unreliable and poor judgment. The writer was not in control of their emotions and instincts at the time of writing. There are signs that the writer is someone who does not like to give a clear-cut image of himself. There are signs that the writer can be evasive." And so on. Like astrology, or psychic readings, or tarot, graphology can produce fun talking points, by randomly throwing personality variables on to the table for discussion, even if it has minimal convincing empirical support for its claims. And like astrology, it has face validity, of a limited kind. But what does it mean when the shadow chancellor of the exchequer uses the science of graphology to attack Gordon Brown: is the political right? The post-Marxist social theorist Theodore Adorno, whom I quote only because it amuses me to quote a post-Marxist social theorist, wrote at length about the psychodynamic links between astrology and fascism, about the need for rightwing ideologists, and especially their followers, to have simple, clear, authoritative narratives, rigid systems, patterns, and structures that make sense of the world. ….."sciences" such as graphology are about elevating our intuitions, an attempt to use "science" to bolster our prejudices with some kind of objectivity, to render them in biomedical terms. George, let's not forget, is no stranger to medicalising his foes, to deploying scientific notions in warfare - a man who has previously suggested Gordon Brown is "autistic", a term that many patients may be surprised to see used pejoratively. "The writer is not shy. The writer shows unreliable and poor judgment. The writer was not in control of their emotions and instincts at the time of writing. There are signs that the writer is someone who does not like to give a clear-cut image of himself. There are signs that the writer can be evasive." Sounds like any MP to me! Sadly the majority of MPs seem to be well described by it. I don't believe in any form of divinification as it is of the Devil. However, I usually plot my lifes course in accordance with the prophetic paper wrapped up inside my fortune cookies. Last week it enigmatically stated:"You will soon partake of a dessert." I was eating the cookie at the time thus making the fortune true. Usually, you have to wait an unspecified amount of time for that stuff to come true. No man could face with equanimity." - W.S. Gilbert (quoted from memory; please forgive the inevitable errors). EWBL, I recently got a Chinese fortune that read, "You shall soon achieve perfection." Aaack! I wasn't planning on leaving this world anytime soon, and I know I won't achieve anything resembling perfection here! Haha, ewbl they were taking the easy parth.. I daresay other ones included you will take a crap and you will continue to breath in and out for the foreseeable future.. I remember the Astrologer. It was one of those things that gave us Brits somethig to be smug about compared to our transatlantic chums! Gilberts could be pretty cutting. I love the quote! Achieve perfection? I would assume that it was for someone else.. or that I was not longer for the world, howeve, where I am going I daresay I will be prodded with forks for eternity and I amnot a masochist so it won't be heaven! Prodded with forks? As in forked tongues? Oh, to dream, jams! Steve, sometimes I swear these fortunes are being written by people who've listened to way too much 80's pop music, and just decide the lyrics are good enough to print. "Love will lead you back to the one you love." Sounds suspiciously like advice meant for has been Taylor Dayne. "If you love somebody, set them free." Sting thought he was so clever to use that sage wisdom in his song, but now he has fortune cookie competition ripping him off! Aw, thanks for the plug, jams. I love your blog too (especially when you cover international stuff that is not written about anywhere else). I was thinking pitchforks ewbl! As for fortune cookies, better then don't say you "prepare to be purged revisionist swine" and then you know you got a North Korean one! It was an excellent article Smowflake and gave me an excellent lead into the Ben Goldacre item.